Lockheed Martin has developed at its Cape Canaveral, Fla.-based facility a lunar habitat prototype for NASA’s lunar Gateway that is slated for launch by 2024, Denver Business Journal reported Wednesday. The space agency plans to award in the fall of 2019 a contract to build the Gateway platform, which will serve as a command center or outpost for astronauts to stage robotic lunar missions from the moon’s orbit. “Instead of it being a destination, it’s really an airport,” Rob Chambers, executive in charge of strategy and business development for human spaceflight at Lockheed’s space business, said of the lunar Gateway habitat. The report said NASA plans to select in March a vendor to develop the Gateway’s solar electric power and propulsion system that is expected to take off in 2022. 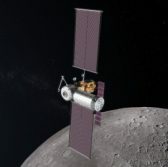 The agency requested industry feedback on cargo delivery requirements for the lunar habitat in October a month after it issued the final solicitation for the Gateway’s propulsion element.